If you are committed to social justice, and want to create lasting solutions to poverty, hunger, and social injustice, join Oxfam by becoming a CHANGE Leader on your campus. Oxfam will support your efforts with leadership and skills training, resources, and year-long support. You in turn will bring Oxfam’s mission to life on your campus through teach-ins, panels, research projects, class curriculum, special events, campus clubs, and more. Each year, Oxfam brings together a select group of 50 student leaders. Together, they learn how to transform their passion for the issues into meaningful action on campus and in their communities, joining a network of like-minded students around the country. Past CHANGE Leaders have gone on to work for members of Congress, start their own nonprofit organizations, and pursue social justice careers worldwide. Students learn about Oxfam’s work, get to know other student leaders from around the world, participate in team building and leadership activities, learn organizing skills, and connect with Oxfam staff. This is done through a variety of activities that include interactive simulations, guest panels, presentations, videos, small group breakouts, creative arts, personal reflections, and more. Founded in 2000, CHANGE has trained over 860 student leaders from more than 345 colleges and universities. For more information, please read our CHANGE FAQ page. Applications for 2019 CHANGE training are closed, but you can fill out the form below to be notified when the 2020 application goes live. You can still be involved with Oxfam on campus by forming a club. To learn more, visit our Oxfam Clubs page. Thank you for your interest! We will reach out to you with more information. Follow Oxfam CHANGE Leaders on Twitter. Become a fan of CHANGE on Facebook. If you are a CHANGE Leader or alumni, log in to the CHANGE Network. You'll find updates about Oxfam’s work, the latest job postings, and opportunities to connect with CHANGE alumni in your area. If you have any questions about CHANGE or the application process, please contact us. In keeping with Oxfam’s belief that everyone has a part to play in the fight against poverty and injustice, Oxfam Toolkits are designed for individuals and groups looking for a hands-on way to join the effort. These practical how-to guides collect ideas and advice from Oxfam’s experts as well as supporters around the country. Oxfam Toolkits represent an entry point into the world of activism—building a grassroots movement for change, one person at a time. In 1974, Oxfam America launched its first grassroots anti-hunger campaign. Among those who joined the effort were high school and university students, whose dedication and optimism attracted others to the cause. 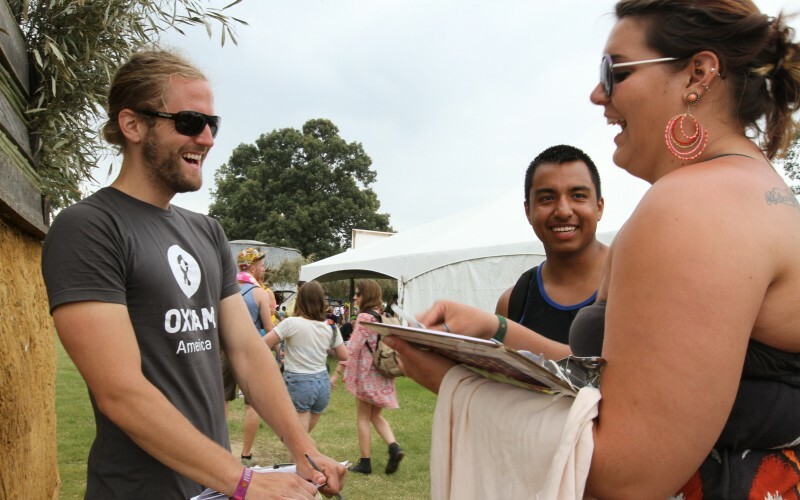 Nearly four decades later, students still number among Oxfam’s most committed supporters, organizing events and building networks on campus and beyond. Today’s student volunteers usually work with Oxfam in one of two ways: as participants in our national leadership program, the CHANGE Initiative, or as members of Oxfam Clubs on campuses around the country. For tips on starting or running an Oxfam Club at your school, see our guide, How to make a difference on campus. Help train a US college student to make a meaningful difference in the fight against poverty, or give another symbolic gift.